Let’s compare some speeds and some prices. Is the value of each expression closer to $\frac12$, 1, or $1\frac12$? Some students did treadmill workouts, each one running at a constant speed. Answer the questions about their workouts. Explain or show your reasoning. Tyler ran 4,200 meters in 30 minutes. Kiran ran 6,300 meters in $\frac12$ hour. Mai ran 6.3 kilometers in 45 minutes. At what rate did each of them run? How far did Mai run in her first 30 minutes on the treadmill? Tyler and Kiran each started running at a constant speed at the same time. Tyler ran 4,200 meters in 30 minutes and Kiran ran 6,300 meters in $\frac12$ hour. Eventually, Kiran ran 1 kilometer more than Tyler. How much time did it take for this to happen? 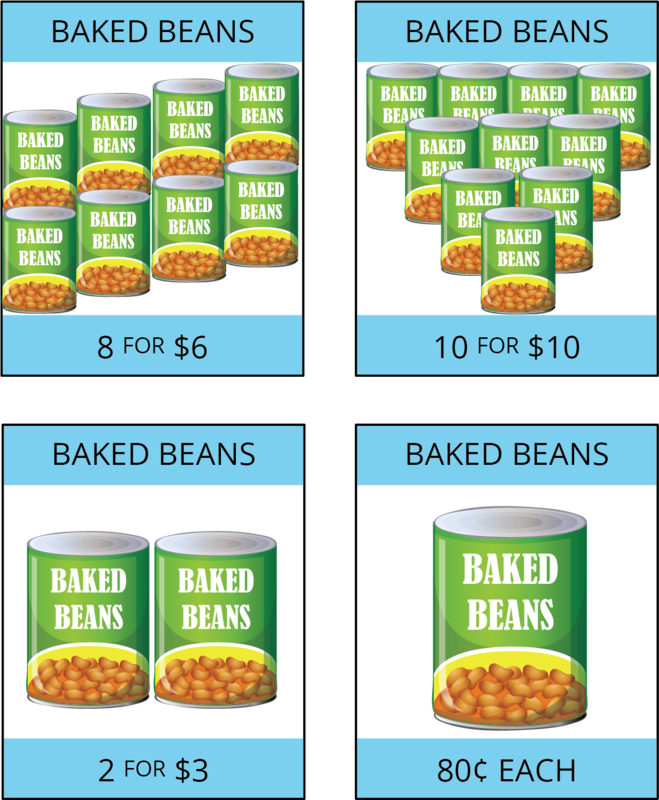 Four different stores posted ads about special sales on 15-oz cans of baked beans. Which store is offering the best deal? Explain your reasoning. The last store listed is also selling 28-oz cans of baked beans for \$1.40 each. How does that price compare to the other prices? Find the time each person took to travel the same distance. The person who traveled that distance in less time is faster. Find the distance each person traveled in the same time. The person who traveled a longer distance in the same amount of time is faster. It is often helpful to compare distances traveled in 1 unit of time (1 minute, for example), which means finding the speed such as meters per minute. Let’s compare Diego and Andre’s speeds in meters per minute. Both Diego and Andre ran 150 meters per minute, so they ran at the same speed. Car speeds in miles per hour. Fruit and vegetable prices in dollars per pound.